And the “something” is definitely spring. 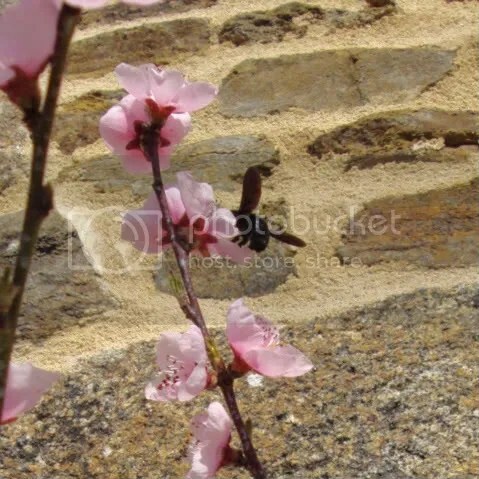 Spring in Normandy is beautiful. Stunning, even. 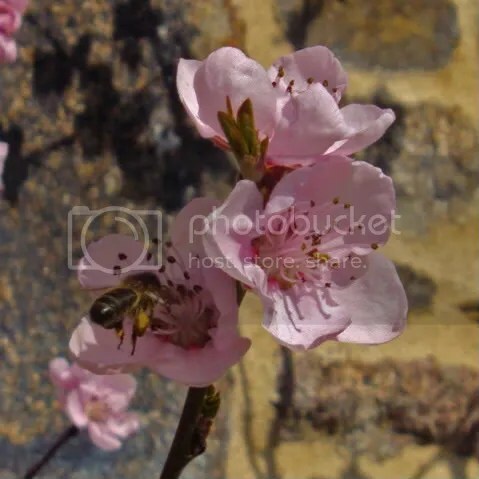 And the air is full of buzzing insects making the most of the warmth to kick off their annual life – and death – cycle. Working in the garden yesterday it was 24°C in the sun. Backfilling a trench alongside the new wall on the terrace was thirsty work. So it made sense to stop occasionally and stare at our young peach tree while I sipped elegantly from an ice cold bottle of water. Well, poured it down my throat at speed is a more accurate description. Shovelling stoney soil in full sun at 2pm is hard work. La Fosse’s little patch of Perriers-en-Beauficel is a hollow near the top of a south-facing hill. Being tucked away means that we avoid the worst of the winds and it also means that when it is sunny, even this early in the year, it can be beautifully hot. 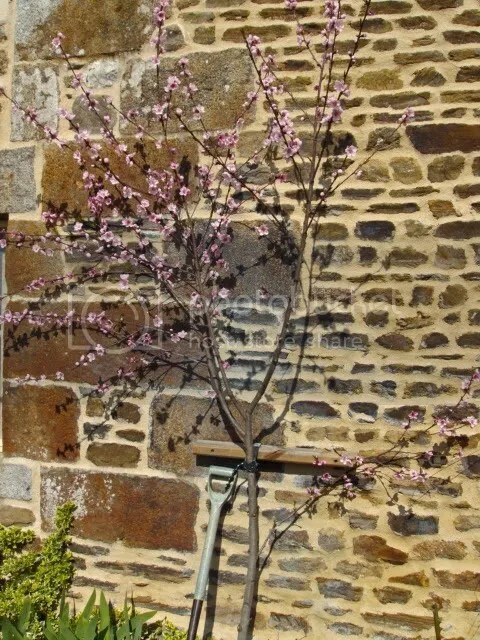 The south wall give excellent protection to the plants because it warms up during the day and continues to give off heat through the night, staving off the effects of any spring frosts. One of the peach trees is a mass of blossom – which bodes well for a good crop of the peaches which, while they’re a bit flat and furry to look at, taste absolutely sublime. It is also a mass of bees of various types, busy pollinating and taking nectar from the flowers. These black bees are fascinating to watch. They’re normally solitary bees, about 2 cms (a little less than an inch) long, burrow (as their common name suggests) into old wood – and there’s plenty of old buildings in the area with exposed and elderly wooden beams which are perfect for this bees habitation needs. They’ll either adapt an existing hole or, if the wood is soft enough and the location appealing, they’ll excavate themselves a new one. Oh, and they have one heck of a “buzz”. They’re not aggressive and while the female can sting (I think) she’ll only do so if seriously provoked – by being picked up or handled. Having carpenter bees around is interesting, not in any way threatening! 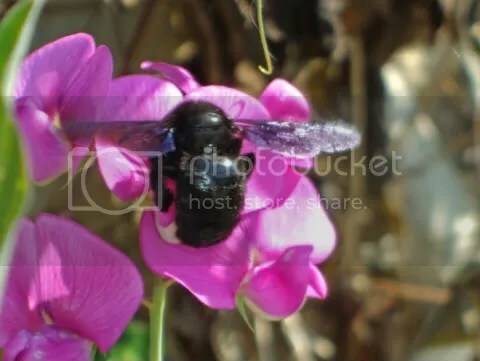 There’s a better photo here (from a few years ago) of a violet carpenter bee on an everlasting pea flower. The flower looks far too delicate to support such a large insect. Apparently, these carpenter bees own the “largest egg laid by an insect” record. Nice to know.